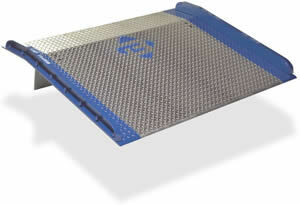 For over 25 years Bluff has manufactured quality steel and aluminum dock boards and dock plates. in 9 different warehouses. Dock Boards and Dock Plates to keep you moving! to Save $$ on Freight. No one offers the vast inventory of dock boards and dock plates at some many points across America at the most competitive prices ever! Dock Plates: Pallet Jack and Hand truck un/loading Light Weight Aluminum - for non-powered loading applications. 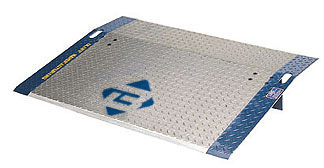 Light weight aluminum dock plates are designed for the ease of use for light weight loading and unloading applications involving: pallet jacks, and hand trucks. Lip bend is 11 degrees, beveled deck edges allow for smooth transition between truck and dock. Deck is made of lightweight aluminum tread-plate. No Fork lift usage.